Self-governance, or self-government, refers to the civic engagement of free citizens, and their consequent interactions with national, state, and local governments. Lack of self-government leads to a "professional" political class. If citizens refuse to govern themselves, then others will gladly take up the task of governing them. The Tea Party protests of 2009/2010 are examples of self-government. A lack of self-government leads to unaccountable bureaucracies, Progressivism, authoritarianism, and ultimately despotism. Most activities of self-governance do not happen on election day or within the boundaries of an election cycle. Self-government can refer to several levels of autonomy: A Nation's right to self-govern in light of globalism. The right of a state to self-govern in light of over-zealous national government. The right of a local government(county, municipality, etc.) to self-govern in light of over-zealous state government. 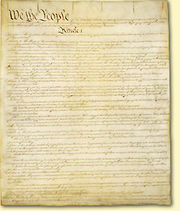 An individual's right to self-govern in light of any out of control, oppressive regime no matter what level it occurs. This page was last modified on 18 January 2019, at 16:58. This page has been accessed 1,897 times.